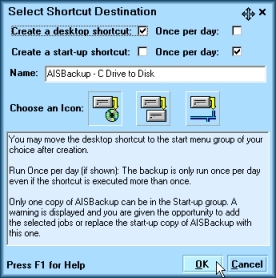 This is the procedure for setting AISBackup to auto run the first time the PC is loaded on specified days, in this example only Monday. Obviously parameters may be adjusted to meet your actual needs. You have a backup job called WeeklyBackup that you want to set-up to run automatically the first time the PC is loaded each Monday. For a general overview on how to set-up a backup job click here. This example does not explain every parameter of the Command Line Generator, for a full list click here. Create the backup job that you want to auto run. 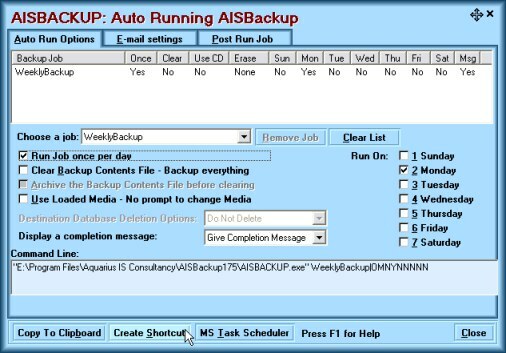 Choose the menu option Tools/ Auto Running AISBackup. The following screen will be displayed. If the above screen is already showing jobs then select Clear List. Select the job that you wish to auto run (in this example the job is called WeeklyBackup) from the Choose a Job drop down list. This is showing <No Job Selected> in the above screen shot. Run Job Once Per Day. Every day of the week is selected in Run On. Leave the Run Job Once Per Day selected. De-Select all days except Monday. Click Create Shortcut, the following form will be displayed. Type a name for the backup job. Select an Icon for the job. This completes the set-up of the auto-run of WeeklyBackup. 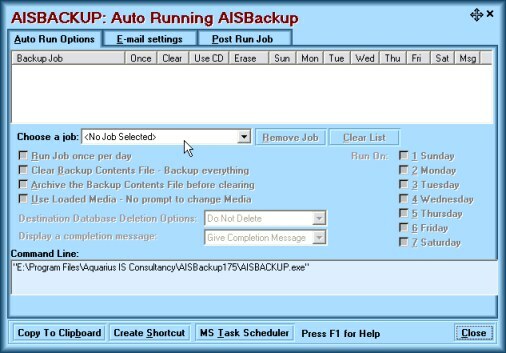 Only one copy of AISBackup can run at a time, if you want to automatically run more than one backup job when the PC is loaded each job must be added to the same backup job. If you have more than one AISBackup job in the start-up folder only the first in the list will run.